There aren’t many days that mark the birth date for multiple members of the Pro Football Hall of Fame, but June 11th happens to be one of them. In fact, three all-time legends were all born on the date: Ernie Nevers (1903), Vince Lombardi (1913) and Joe Montana (1956). Ernie Nevers (1903-1976) – A member of first class of Pro Football Hall of Fame enshrines, Ernie Nevers was a five-time All-Pro in five seasons for the Duluth Eskimos and Chicago Cardinals. A college star at Stanford University, Nevers was part of the NFL in the early, less structured era. In 1926 he played both ways and was on the field for 1,714 of a possible 1,740 minutes during a 29 game schedule. Playing for the Chicago Cardinals in 1929, Nevers scored all 40 points (six touchdowns and four extra points) in a 40-6 victory over the Chicago Bears. In 52 official NFL games during his five seasons, Nevers scored 38 touchdowns, while also kicking 51 extra points and seven field goals for 301 career points. 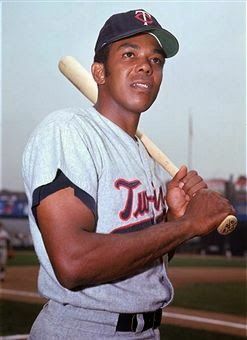 During his career, Nevers served as player-coach of both the Eskimos and Cardinals. 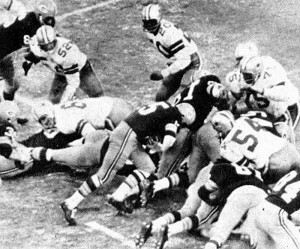 Bart Starr scores the winning touchdown in “The Ice Bowl” on this one yard plunge into the end zone. The Dallas Cowboys and the Green Bay Packers. Need anyone say anymore? Despite that, there is plenty to talk about. Especially when the two of them meet in the NFL playoffs because memories abound. Chief among them is “The Ice Bowl” which was played on Dec. 31, 1967 at Lambeau Field. The winner was the champion of the NFL (which became the NFC) and advanced to Super Bowl II to meet the champion of the American Football League (which later became known as the AFC). This game is one of the most storied in the history of the National Football League. The postseason series resumes today when the Packers host the Cowboys in the NFC divisional playoffs. 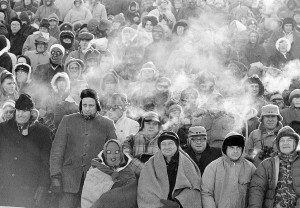 The temperature at game time was -15 oF and the wind chill was about -48 oF. While Green Bay had the home field advantage that day, the elements were surely not friendly to either side. What edge the Packers had came from them just being used to it more during that time of the year compared to their visitors. It was so cold that attempts to heat the field backfired, transportation problems occurred, and equipment malfunctioned. Even though a tarpaulin covered the field in the days leading up to the game, it left moisture on the field which froze in a flash after the tarpaulin was removed. This created an icy surface on the field that got worse as the game wore on. The turf-heating system for the field malfunctioned and many players had difficulty starting their cars forcing them to make alternative transportation plans in order to get to the stadium on time. When the game did finally begin, referee Norm Schachter blew his whistle only to have it freeze to his lips. Upon freeing it from his lips, he ripped his skin off. The resulting blood just froze to his lips. The marching band from Wisconsin-State University LaCrosse (now The University of Wisconsin-La Crosse) could not perform their pre-game and half-time shows as their instruments froze and would not play. Several band members also got transported to area hospitals for hypothermia. This was literally a test of attrition and the limits of the human body were tested for every player, coach, official, fan, worker, and media person that day. one-yard line on third and goal with 16 seconds left to play provided the winning score. Starr had called timeout prior to the play to discuss strategy with Green Bay coach Vince Lombardi. Knowing that the traction was difficult with the icy field, handing off to a running back or stepping back to make a throw would have been difficult. So Starr convinced Lombardi to sneak it in. In doing so, Starr followed a double team wedge block from right guard Jerry Kramer and center Ken Bowman against Dallas left defensive tackle Jethro Pugh to cross the goal line for the decisive score and a 20-17 lead. The extra point provided the final score. Dallas would down the ensuing Packers’ kickoff and could manage only two incompletions which ended the game. Jubliant Green Bay fans rushed onto the field knocking over players from both teams. It was the end to an iconic game in NFL annals. 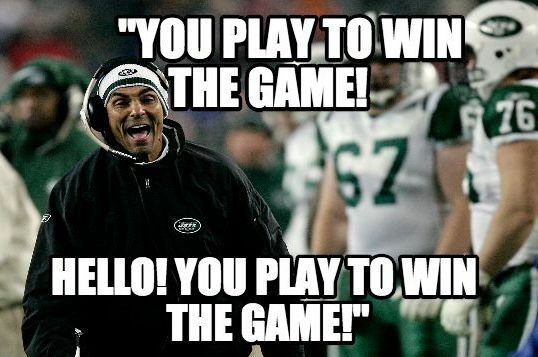 Herm Edwards always tells it the way it is. Everyone knows, nothing shakes an audience as well as heart pounding, chest thumping speech from that grey-haired, wily coach imparting life truths on his team. It’s a tried and true formula which seemingly will never die. Some of the more brash coaches have been less about inspirational locker room speeches, and more about snarky comments during interviews. But of the many words said by coaches so far, which life truths have been the most truthful? Which words have been most memorable? Let’s break it down. When asked by reporters if he would rest his players and throw away a game since it had no playoff stakes late in the season, Coach Edwards put himself into SportsCenter lore with not only the unbelievably iconic statement, but also the indignant manner in which he spat it out. 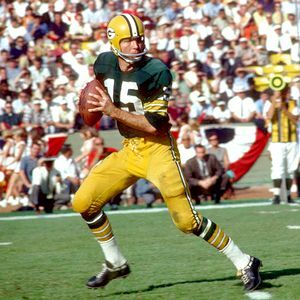 The January Sports Then and Now Vintage Athlete of the Month was the MVP of the first two Super Bowls and is the only quarterback to lead his team to five NFL Championships. 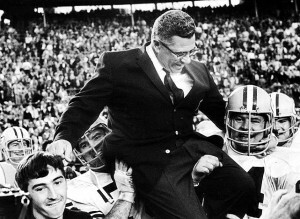 Though he was only a head coach for a decade, many consider Vince Lombardi the greatest coach in NFL history. There are plenty of candidates for the title of best football coach ever, but there can only ever be one winner; by common consent, that is Vince Lombardi. He was a tough taskmaster who thrived on hard work, had exacting standards, and expected nothing less than 100 percent from his players. 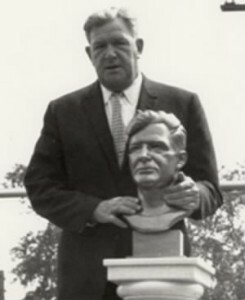 He coached Green Bay to five championships in his nine seasons at the helm and, in a period that saw the Packers take the first two Super Bowls, the ultimate accolade from the NFL, the World Champions Trophy now bears his name. Lombardi started his football on the field and was a formidable player on the offensive line at Fordham University but coaching proved his true metier, as modern fans of live football commentary will attest. After working as an assistant at Fordham, he joined the staff of the legendary Red Blaik at Army in 1949. His professional coaching career started at the New York Giants, alongside another legendary coach in Tom Landry, with Jim Lee Howell as the head; that triumvirate coached the Giants to the 1956 NFL championship.